Do psychiatrists believe in madness? This post, written in 2006 by Karim N'Diaye, was first published on the Alphapsy blog. A short notice of a short paper investigating whether clinicians hold an essentialist view on mental disorders, i.e. whether they consider that mental disorders represent natural kinds possessing "an underlying reality or true nature, shared by members of [the same] category". What is your guess? Well, clinicians doubt it, at least much more than for other medical disorders. 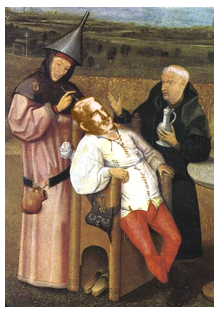 The 19th century German psychatrist Emil Kraepelin submitted to the medieval Cure of Folly. Adapted from The Cure of Folly by Hieronymus Bosch, ca. 1475, now at the Museo del Prado, Madrid. See commentary on the original painting by C. G. Gross. From asking novice and trained psychiatrists, clinical psychologists and social workers about their beliefs on the defining feature of various mental disorders, the causal role of these features and the continuous/discrete nature and natural/cultural status of such illnesses, Ahn found very low support to the idea that clinicians endorse an essentialist stance towards mental disorders. The news should bring some hope to the many who worry about the evolution of modern psychiatry. Richard Bentall, professor of clinical psychology at Manchester University, is one of those. In his last (and captivating) opus, Madness Explained: Psychosis and human nature, he spend some 600 pages (shortened to 14, here) debunking the current view inherited from the late German psychiatrist Emil Kraepelin that major mental disorders such as schizophrenia constitute monolithic entities (read: "naturel kinds") defined through a core set of symptoms. That is not to say that psychiatric disorders are merely social constructs as the most Foucaldian would argue. Quite the contrary, Bentall says, there is no such thing as psychoses. Yet, even though psychotic symptoms bear no essential relation one to the other, they do provide cues on underlying cognitive or behavioural dysfunctions. According to Bentall, only a multidisciplinary approach bringing together knowledge of cognitive subsystems, lifetime development and socialization processes will shed light on these conditions and (possibly) come up with more humane treatments. I am definitely not saying here that Bentall and the like set up a straw man. No. The neo-Kraepelian view they dismiss does have a large audience among mental health professionals, even if when asked explicitly, they may express some critics towards the nature of mental disorders. And the mere fact that drapetomania once entered the psychiatry's repertoire as an "irrestrainable propensity to run away" calls for prudence if not skepticism: Dr Samuel Cartwright who defined drapetomania also noticed how prevalent it was among black people… in slavery. Another interesting thing in Ahn's results lies in the fact that clinical practice and training seem to increase doubtfulness towards the reification of mental disorders. That is where the question at stake meets "folk psychiatry": is there a natural tendency for people to reify mental disorders? Some say so. However, I wonder whether this might be a cultural bias stemming from the diffusion of basic medical knowledge in the general population and domain-general category-based inference. Has any of my brillant readers any idea about this? PS: As Jonah Lehrer notes mass media coverage of neuropsychiatry may indeed be very naive.